Today, we bring to you an instrument whose glimpse we had given in one of our earlier posts. The Xaphoon or Bamboo Sax is a single reed wind instrument that was invented during the 1970s by Hawaii based instrument maker Brian Wittman. Since Wittman stays in Maui, Hawaii from where he acquires the bamboo for making this instrument, it is often referred to as the Maui Xaphoon. 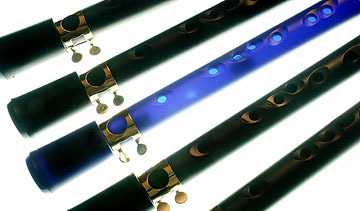 Measuring only over a foot long (12.5 inches), the Xaphoon has a chromatic range of 2 octaves. Although it looks like a flute, the sound of a Xaphoon is more similar to a Saxophone or a clarinet (and hence the name Bamboo Sax). Since its invention Wittman has made over 40,000 Xaphoons manually. Making a Xaphoon is quite a long and tedious process. Since the bamboos from which the Xaphoons are made have different dimensions, mass production is nearly impossible. The bamboo is cut and dried for six months before the production. Then the mouthpiece is cut out in a parabolic shape and the windpipe is carved skilfully. Another reason that makes the production of this instrument unique is that the tuning is done by the instrument maker based completely on his own judgement without using any measurements. Mineral oil and varnish are then applied to give a finishing touch. An impressive video of the production process is available on the official Xaphoon website. The Xaphoon became so popular worldwide that it was impossible to fulfil all the orders in the traditional way. Hence, in 2000 an injection moulded Xaphoon called the pocket Sax was created. The pocket Sax is a much more portable and affordable instrument and is generally used by beginners to get a hang of the instrument. With some colours added, the instrument looks even cooler. The Cobalt Blue Pocket Sax appears dark until held in light and in a proper arrangement creates a perfect jazzy ambience. Just like the Hang Drum, the Xaphoon has not yet found its way into popular music despite its beautiful soothing sound. 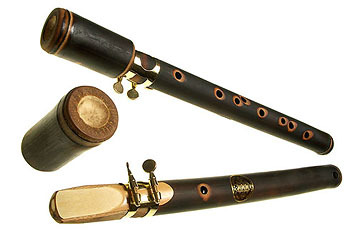 A story goes that Simon and Garfunkel used a Xaphoon during one of their Australian concerts. Paul Simon also featured the instrument prominently during his 2006 U.S. tour. Mark Stuart who plays Xaphoon with Paul Simon is the most celebrated Xaphoon player of all. Former U.S. president Bill Clinton, who is himself a saxophone player, was apparently impressed by the Xaphoon when it was played at a TED conference in 2007. It is said that the Xaphoon is one of the easiest wind instrument to learn and it produces a wide variety of sounds. Also at $50, the pocket sax is highly affordable. So the next time you feel like learning an exotic instrument do place an order for the Xaphoon. Unlike the usual, we leave you today with the audio files of some classics played on the Xaphoon. Also check out a Scottish Fusion band playing a Bollywood number on the Xaphoon. Enjoy! I have just invented a new instrument called the Saxinet which I thought you and your readers might be interested in. The Saxinet combines elements of chalumeau, clarinet, recorder and saxophone and I believe that it could become an important tool in music education. Please have a look at my website or go directly to http://www.Saxinet.com . I’d be very happy to discuss this further with you or answer any questions you might have. Can I use the soundsamples at my web site? How is playing it? I like it.